The Institute of Advanced Motorists (IAM), which styles itself, disingenuously, as "the UK's leading road safety charity", has produced a report called Licensed to skill (funny-punny-groan-groan) on the contributory factors in road accidents (or what us more enlightened/PC people call "crashes"). Using data gathered by police and spanning 700,000 accidents from 2005-2009, the Institute of Advanced Motorists (IAM) has analysed, in breathtaking detail, the anatomy of a road accident. Unexpected findings emerged, not least the relative unimportance that speeding plays in road accidents that kill six people each day in the UK, leave 68 others seriously hurt and 535 with less serious injuries. "It has been an eye-opener," says project manager Neil Greig, of the IAM. "Not just in terms of what causes an accident but in terms of dispelling some of the popular myths. For instance, if you look at Government campaigns they seem to say that speed is the number one problem. But illegal speeding – when drivers exceed the posted limit – accounts for only 13.9 per cent of fatal accidents. A bigger cause [15.9 per cent] is going too fast for the conditions – entering a bend too quickly, for instance – when you might well be under the actual speed limit." The statistics are quite clear on this and it's "driver error or reaction". It's listed by police as a factor in more than 65 per cent of fatal crashes and the heading covers a multitude of driving sins many of which you're probably on first-name terms with. Topping the charge sheet is failing to look properly (the Smidsy factor – "Sorry mate, I didn't see you', relevant in 20.5 per cent of fatals involving driver error), followed by "loss of control" (34 per cent) which, says Greig, often means leaving yourself with "nowhere to go" after entering a bend or other situation, too quickly. Other errors include "poor turn or manoeuvre" (12 per cent) and "failed to judge other person's path or speed" (11.6 per cent.). Second biggest cause of fatal accidents, to blame for 31 per cent, is the "injudicious action", an umbrella term for "travelled too fast for the conditions' (15.9 per cent of those labelled injudicious), "exceeded speed limit" (13.9 per cent) or "disobeyed give-way or stop sign" (2.1 per cent)? Third culprit in the daily gamble on who lives and who dies is "behaviour or inexperience" (28 per cent), which covers faults such as "careless, reckless or in a hurry" (17 per cent), "aggressive driving" (8.3 per cent) and "learner/inexperienced" (5.3 per cent). So it goes on. So what's the purpose of all this? What's the IAM's purpose, and what's The Telegraph's purpose in their presentation? 'Cause on my reading of this, they are starting out by telling us that the role of speed in "accidents" is a "myth", and then as it goes on, as my emphasis shows, it turns out, it is mostly about speed. So what the heck are they trying to tell us? All this amounts to saying is that crashes occur because drivers make mistakes that their speed or another's speed makes it impossible for them to correct before they collide with another road user. Amazing. Big deal. Who would have thought it? One good thing about The Telegraph is that the readership is quite intelligent, so the comments on the story are mostly worth reading, many of them making more intelligent points than the article itself. And Telegraph readers know the difference between "their", "there" and "they're", and think it worth pointing these errors out. Instead of delivering "evidence on the causes of road traffic accidents" the problem is simply restated. You might as well say accidents are caused by errors. Or accidents. This is so far behind safety-industry norms - notably, airline risk management - as to be depressing, given the richness of the statistical data. One no longer speaks of 'pilot error', because it is so vague as to be meaningless, implies culpability, and is essentially a truism... but instead seek[s] to get away from obvious proximate cause to underlying, often obscure fundamental causal factors, including (but not limited to) organisational and environmental factors which combine to put the human 'software' we all of us run in a position where it comprehensively fails. After each injury accident the police fill in STATS 19 report form which lists a set of possible causes of the accident for the officer to chose from. It is their opinion of what has caused the collision. While there is a wide range of causes of collisions, the injuries that we suffer and the damage to vehicles and property is 100 percent attributable to the speed and energy of collision. All this work by the IAM seems to be is an aggregation of the STATS 19 data collected by police officers. We know that the amount of time and money spent by the police investigating each collision is grossly inadequate – according to Amy Aeron-Thomas of RoadPeace, they spend typically £2,200 on fatal crash investigations, £250 on serious injury crashes and £60 on slight injuries, compared to £20,000 on a typical homicide. And there are no national standards for crash investigations, so 43 local police forces do their own thing, and it's rare to get accurate speed estimates. So this data is all just based on assessments of which of a set of fixed options on a form best correspond to the causes of an accident as it appears to a possibly ill-trained (for this job) and ill-equipped police officer doing a rushed and often superficial and inadequate investigation of a crash, in a manner that is not even nationally standardised. Just aggregating this published data hardly amounts to real research on the "causes" of "road accidents". 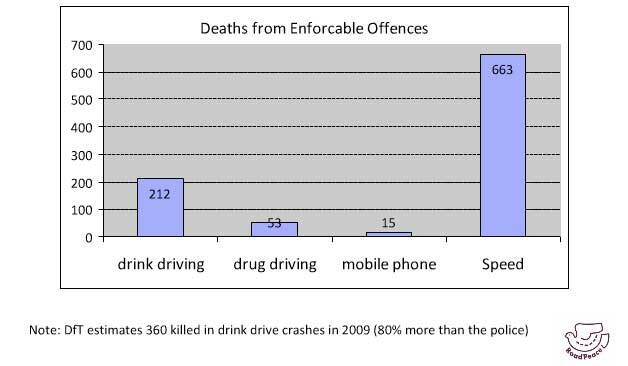 The apparent DfT/police argument indicated here about exactly how many crashes are due to drink driving highlights the subjectivity and doubt inherent in all these statistics. But the simple message many motorists will take from the IAM's work and The Telegraph's reporting of it, the message they are intended to take, is that "Speed does not cause accidents, so it's OK to speed". The energy dissipated in a collision increases as the square of the speed so at 30 mph you will do more than twice as much damage as at 20. We want to stop motorists being used as cash cows. For too long information about speed cameras has been hidden in the shadows. This data will end that by clearly showing whether a camera is saving lives or just making money. We intend for the action we take [on road safety] to be seen as acceptable and proportionate to the majority of motorists. He's flanked by two racing car drivers. Not many vulnerable road users get killed on the racing track. So that proves it, as the IAM wants us to believe, it's not about speed, it's about skill. It's about being an "advanced motorist". With an institute specially for you. To tell you there's no problem with your speed so long as you are skilful enough. In a nation where everybody who wants to use the roads needs to get into metal boxes filled with airbags and crumple zones to protect them from all these other skilful drivers. And what if you want to walk or cycle? God help you, because accidents happen, and when they do, it's their speed that kills you. David, what's the source of that Deaths from Enforceable Offences chart? Is it STATS19 - seems to be a police estimate? "We intend for the action we take [on road safety] to be seen as acceptable and proportionate to the majority of motorists." These people are too chicken to do the right thing for the majority of vulnerable people. After all, if you ride a bike or walk you're not a proper grown-up so you don't count wheras motorists are allowed to vote. If there was any other activity that killed as many innocent third parties it would be banned - look at smoking in work places, but Herod Hammond and Co seem hell bent on making it easier to slay the innocent. It would be interesting to chart the data so that overlap of possible causes from STATS 19 reports can be easily visualised. I'd imagine a graph with nodes representing possible causes (sized according to prevalence) and edges representing cases where both possible causes were noted on the STATS 19 (widths according to prevalence). As it stands these overlaps are missing and could throw up interesting correlations. However, to get that data would require going straight to the "Department for Transport Accident Statistics Branch" for the accident records, almost 700,000 of them (or 11,968 if you only count fatal accidents). The biggest concern I have about STATS19 in general is the accuracy of the data - or more specifically, that we don't know how accurate it is. The police officer filling in the form can only record information that is reasonably certain. The speed of impact can be determined by the damage to vehicles, but what is a lot less certain is how fast a vehicle was travelling in the ten or twenty seconds before the impact. If a vehicle was travelling at 70MPH, the driver may have been able to slow to an impact speed of 40MPH leaving no physical evidence on the road in the form of skidmarks. If the speed limit was 40MPH or even 50MPH, the collision may well have been avoided altogether if the driver was not initially speeding, yet the STATS19 would not record excessive speed as a cause. In simple terms, the fact that 'exceeding speed limit' isn't often recorded as a cause may be less down to its actual prevalence and more down to difficultly to establishing it as a cause compared with other, more commonly-cited factors. In even simpler terms, if 'exceeding speed limit' was recorded as a cause in 13.9% of accidents, it does not follow that it wasn't a cause in the other 86.1%. In the simplest possible terms - this is bad science. I think the biggest 'Myth' that these arseholes fail to dispel here is the one that results in a majority of motorists misunderstanding the word 'Limit'. A majority of motorists whether they admit it or not behave as if the posted limit is one that they should avoid dropping below, hence 'driving too fast for the conditions'. As good as the IAMs is, it is no substitute for someone using the brain they are born with.